There seems to be a real need for a short yet rigorous text in spherical trigonometry which shall contain little more theory than is needed for the solution of spherical triangles, with a few applications to add interest to the subject. This book is the result of an effort to meet that demand. As there are often but few class hours to be devoted to the subject, the aim of the writer has been to present matters in such a way as to enable the student to master the elements with little help from outside. The average student finds it hard to do this when he must pick out the essentials for himself. 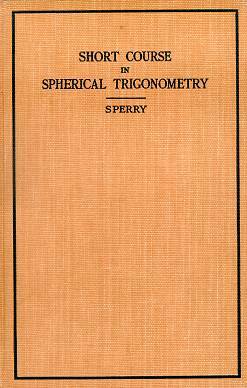 A knowledge of spherical geometry is not presupposed, but a brief presentation of the principal concepts and theorems is given in Chapter I. Most of the theoretical examples bear directly on the development of the theory in the text. The data for the numerical solution of triangles are such as to require a minimum of labor in computation while offering a wider variety of applications of the theory than is usual in problem sets. Especial attention is called to the summarization of the tests for the number of solutions in the ambiguous cases in four short and complete tables, material usually covering several pages and often incomplete. The student is encouraged to check all solutions, and methods of checking are given in every case. The time required for the discussion and solution of the general spherical triangle may be reduced by half by considering only Cases 1, 2, and 3 in Chapter III, explaining how the other cases may be solved by means of the polar triangle. The terminology and symbols used follow the recommendations in the Report of the National Committee on Mathematical Requirements under the auspices of the Mathematical Association of America (1923).